The lady charged into the old boys club and beat them on their own turf. Genuine Risk won the 1980 Kentucky Derby, the first filly to do so since Regret won the race in 1915, a sixty-five year drought for female thoroughbreds. In fact when she won the Derby she was the first filly to even attempt the feat in twenty-one years. Only one other filly has won the Derby since Genuine Risk claimed her victory, who in the process claimed the hearts of all thoroughbred fans. Genuine Risk was bred by Mrs. G. Watts Humphrey in 1977 and subsequently sold as a yearling to Bert and Diana Firestone at the Fasig-Tipton July sales the following year. The Firestone’s son Matthew was actually the keen eye who spotted her. 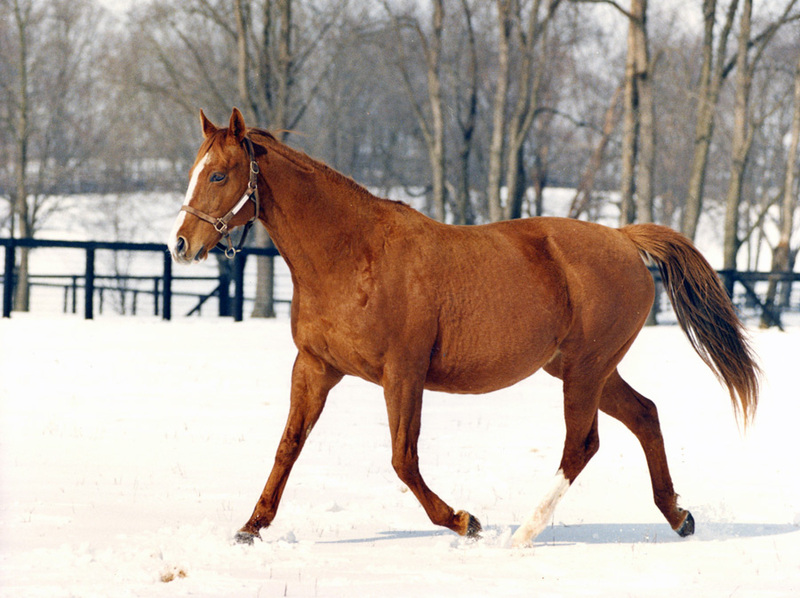 He noted that her sire is Exclusive Native, the sire of Affirmed who had just recently won the Triple Crown. Master Firestone insisted that his parents buy this chestnut filly, which they successfully did at the price of $32,000. The dam of Genuine Risk is Virtuous, a daughter of Belmont Stakes winner Gallant Man. This part of Genuine Risk’s pedigree is very interesting as we can see Zucchero as the sire of her second dam Due Respect. Zucchero was a talented but extremely erratic son of Nasrullah. Also with in the fourth generation of the Genuine Risk pedigree are Mahmoud, Bois Roussel, Equipoise and Polynesian. She is a direct tail male descendant of Native Dancer. Virtuous is also the dam of stakes winner Sorbet. The highly regarded trainer Leroy Jolley, a Hall of Fame inductee, was entrusted with her conditioning and racing career. Jolley would comment that Genuine Risk, known as Genny in the stable area, was a model student and did everything asked of her as she prepared to become a racehorse. And what a racehorse she became! The début of this future champion was a winning one and it came on September 9, 1979 at Belmont in a six and one-half furlong maiden special weight race. This was followed up with a win in a one mile allowance race at Aqueduct eighteen days later. Jolley sent her out for her first stakes race on September 5, 1979 in the grade three Tempted Stakes. Genuine Risk won the one mile event at Aqueduct and then twelve days later she scored in the G2 Demoiselle Stakes, also at Aqueduct. In the latter race she beat that year’s champion two year old filly Smart Angle. The Firestones and Jolley knew they had a special filly in their barn. Given time to rest, Genny made her three year old début in a seven furlong allowance at Gulfstream Park, winning. This was followed by another winning effort in a one mile allowance at Aqueduct. The now undefeated filly was then given a stern test in the Wood Memorial against some of the top three year old colts aiming for the Kentucky Derby. She was beaten for the first time finishing third to Plugged Nickle and Colonel Moran in this race, but was far from disgraced, acquitting herself admirably. The Firestones wanted to enter her in the Derby but Jolley was a little apprehensive of the idea. He figured she would be better off in the Kentucky Oaks against fillies, but the Firestones were very confident of her ability and of Jolley’s ability to get a horse ready for a big race. So the decision was made, Genuine Risk will go against the norm and tackle the boys at Churchill Downs on the first Saturday in May. The race was considered a wide open affair with Plugged Nickle, Rumbo and local favourite Rockhill Native as the three most likely to take the roses. Jacklin Klugman was also given good support from the huge crowd jammed into the Churchill Downs track that day. Genuine Risk garnered some support but at 13/1 she was considered as an outsider in the field. Many people were not convinced that a filly could win. The weather was perfect for what became an historic day. Genuine Risk started from stall ten in the thirteen horse field. She broke cleanly from the gate and sat in sixth around the first turn. Rockhill Native took the lead along the straight and led the field through the first turn and along the backstretch. The pace was not quick as Plugged Nickle stalked the leader. Jacinto Vasquez would angle Genuine Risk to the outside of Plugged Nickle on the far turn and then asked his filly for her run. Genuine Risk responded immediately and swept past the leaders at the top of the home stretch. Genuine Risk powered her way through the stretch and kept Jacklin Klugman at bay as well as with holding the late charge of Rumbo to win the Kentucky Derby by a length at the wire. Her final quarter mile in the race was the second fastest ever run up to then. Only Secretariat had run a faster final quarter that Genuine Risk. The Preakness Stakes at Pimlico was next, and Genuine Risk faced a very different group. Jacklin Klugman and Genuine Risk were the only starters from the Derby field. Also in the field was Colonel Moran, Codex, the Santa Anita Derby winner who was in-explicitly not nominated for the Kentucky Derby, as well as four others who were considered as long shots. The race became a very controversial affair. Codex won the race but the controversy would come at the top of the stretch run when Codex, the leader at that point, drifted out to take Genuine Risk wide off the turn as she was making her run. There was slight contact made. Jockey Jacinto Vasquez lodged a foul with the stewards claiming that Angel Cordero had struck Genuine Risk in the face with his whip during this close encounter, thus compromising the filly’s momentum. The appeal was denied and Codex stood as the winner, Genuine Risk second and Colonel Moran third. However Bert and Diana Firestone had other ideas. They lodged an appeal to the Maryland Racing Commission. A three day hearing in which there were many witnesses testifying as to what they saw, as well as the stewards tapes and the tapes from the ABC television broadcast were entered into evidence. The five member board voted three to one, with one abstention due to personal involvement with the filly’s owners, in favour of upholding the existing ruling. The Firestones while obviously disappointed did not take the matter any further. So know it was on to the Belmont Stakes. Genuine Risk was attempting to become the first filly to finish in the top three in all Triple Crown races. She ran second on a muddy track to Triple Crown newcomer Temperence Hill, with Rockhill Native third, while Codex and Rumbo finished far behind these three. Genuine Risk had proved her speed, endurance and class. She was the only racer to finish in the top two in each of the Triple Crown races in her year, and remains to this day the only filly to do so in the history of the American Triple Crown. Her next race came three months later in the grade two Maskette Stakes at Belmont. Genny finished a determined second to Bold ‘N Determined, a filly on top of her game who had won the Kentucky Oaks, Spinster Stakes and CCA Oaks in a season that saw her win six grade one races. In fact if it were not for Genuine Risk, Bold ‘N Determined would have been the champion three year old filly. Genuine Risk finished her three year old season seventeen days later with a convincing score in the grade one Ruffian Handicap, over the very good four year old mares Misty Galore and Its In The Air. Genuine Risk was named as the Eclipse Award champion three year old filly in 1980. Back as a four year old, Leroy Jolley entered his popular champion in a seven furlong allowance race on April 11 at Aqueduct. She won the race by nine and one half lengths. Seven weeks later she ran third in a one mile and one sixteenth allowance on grass at Belmont, her only race on such a surface, Genny’s final career race came three months later with an eight length win in a seven furlong allowance at Saratoga. Her career actually ended when she went back for the Belmont meet. She had gotten loose in the barn area and hurt herself severely enough, after she struck a fire hydrant with her left front knee. Genuine Risk retired from racing with a very impressive record of ten wins from fifteen starts, three second place finishes and a pair of thirds. She was never off the board. Now it was time to go to the breeding shed and try to recreate herself through her offspring. Unfortunately this is where Genuine Risk did not have any success. Her first mating was to Secretariat, the first time two Kentucky Derby winners had been bred to each other. Sadly the colt foal was stillborn. Bred back to Secretariat, Genny failed to produce a live foal. There would be one disappointment after another for twelve years, until a chestnut foal colt was born in 1994. The little miracle colt was by Rahy and would eventually have the name Genuine Reward. Genny’s fans and her human loved ones were thrilled for their beloved mare. The farm received bags of mail from Genuine Risk’s adoring public, along with flowers, balloons, and a flood of phone calls. The announcement that Genuine Risk, after so many heartbreaking attempts to become a mom, finally got the chance to have her own little boy at her side in her stall and paddock was great news throughout the equine world. Genuine Risk gave birth to one more foal three years later, another chestnut son named Count Our Blessing. Unfortunately neither son would ever race. Count Our Blessing was gelded and became a show horse while Genuine Reward went to stud in Wyoming where he would sire polo ponies, of all things. Genuine Risk was retired from breeding a couple of years after producing Count Our Blessing. She was visited daily by fans and friends, have a steady intake of her favourite treats of peppermints and Tic Tacs, was doted on by the Firestone family and lived like a queen. Genny found a job as a mentor to young fillies that had been recently retired from racing to become broodmares. On August 18, 2008, Genuine Risk passed away. She died peacefully in her paddock in the morning after a good breakfast. She died not from illness but from old age. She was thirty-one. Genuine Risk was one of the most beloved Thoroughbreds in history. She was fast, beautiful, charismatic and a joy to be around. Jenny was special. Great story about a very special mare. Her effort inthe Preakness was spectacular. She deserved to win. She has always been close to my heart. Happy she had a wonderful life after her retirement. Wish all horses had the same. Wonderful stuff and i enjoyed learning more , and look forward to saving more of your work. Thanks for it : ] t.l. I have always loved Genuine Risk. I don’t believe she ever got the respect she so rightly deserved.I was there , working at Churchill Downs the day she won the Derby. I will never forget watching her at the test barn after the race. While she was getting her bath outside the barn, she stood like a statue with her head up. Her whole attitude said she knew she had won and was so proud. She would undoubtedly have won the Preakness if it had not been for the Dirty unethical tactics of Angel Cordero. I have despised him ever since that day. I saw it when it happened ( and was screaming at the TV), and watched the replay several times. Cordero INTENTIONALLY carried her out and when that didn’t deter her and she was coming alongside him, HE INTENTIONALLY HIT HER WITH HIS WHIP ACROSS THE FACE at least twice. He should have been taken down and should have gotten days and a fine. But, instead, the powers that be gave him the race and no consequences.But, after all, it was the ” great” Angel Cordero. He was always one of the dirtiest riders who would do anything for a ‘ win’. I am so happy’ Genny’ was so well taken care of by her owners and lived a long and good life.